It was nine years ago that I landed a bottle of 20 year old Pappy Van Winkle. It’s sitting in a cabinet in the kitchen, half drunk, only attended to once, maybe twice per year. I’ll have it polished off sometime around 2016. When bourbon is priced like gold you have to be parsimonious with your intake. But Michters of Louisville (originally est.1753 in Pennsylvania though the logistics of their birth takes in some hefty leaps of faith and creative narratives) is taking the concept of stratospheric pricing to a whole new level. Next week, bars and restaurants with fat coffers, will begin taking delivery on Michter’s Celebration Sour Mash Whiskey, a super-premium blend of some of distiller Willie Pratt’s favorite whiskies. Pratt hand-selected the fire water from casks aged 20-30 years old along with a handful of more contemporary whiskeys. All the bottles are spoken for, but one imagines you can walk into a bar and purchase the liquid gold shot by shot. At $350 per gulp. 273 bottles of this liquor were produced. 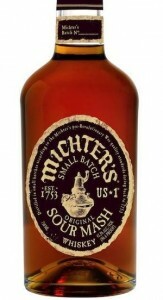 This entry was posted in FOOD and tagged Michter's Celebration Sour Mash Whiskey, willie pratt. Bookmark the permalink.